Copyright ©2015-2019 by Zappadoc – All rights reserved. 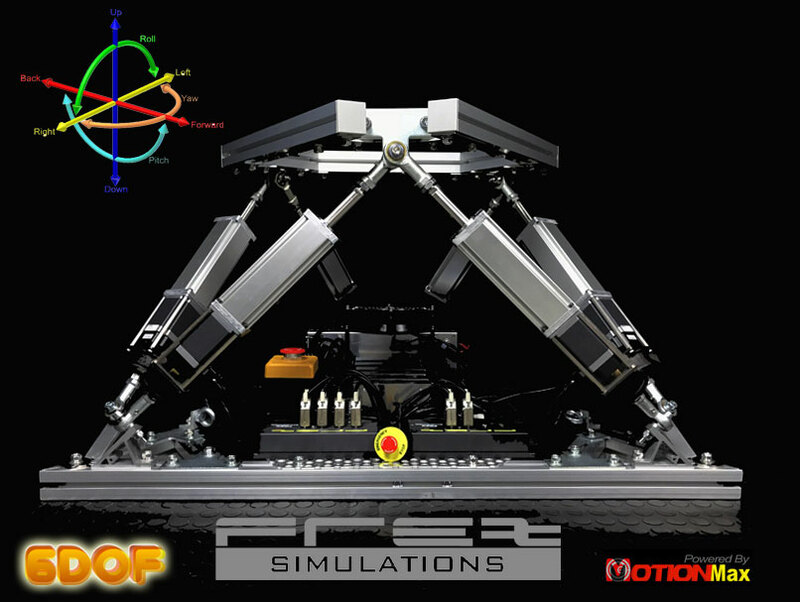 Get the most advanced and professional 6DOF motion platform manager. A powerful tool for your 6DOF simulator! EXEMPLARY, OR CONSEQUENTIAL DAMAGES OF YOUR HARDWARE. By using our software you agree to these terms and conditions. All product names are trademarks or registered trademarks of their respective holders. 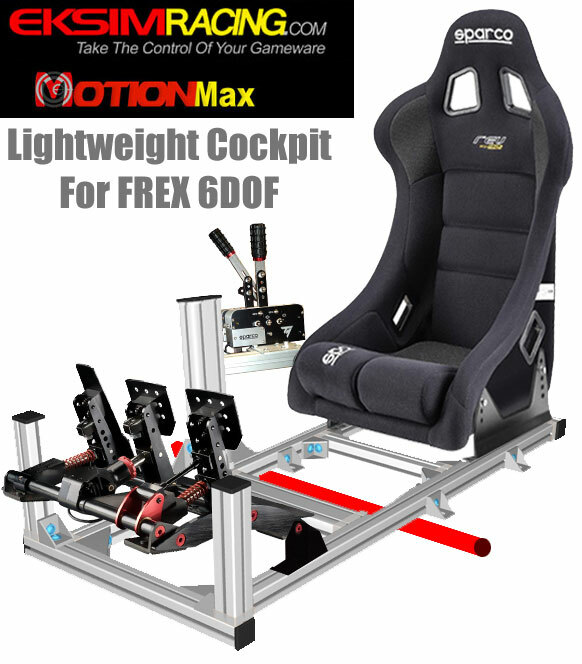 IMPORTANT: The current max weight of the FREX 6DOF Motion Platform is limited to 130 Kg (286 lbs) including the driver + the cockpit with all its sim racing equipment + 5Kg (weight of the top frames of the platform). We assume here that ALL THE HARDWARE IS READY TO USE AND THE 6DOF MACHINE CONNECTED TO THE PC, which includes you follow the mounting and wiring instructions from FREX. – so you know exactly which COM port is connected to each actuator from ID 1 to 6. It’s recommended to write it down. 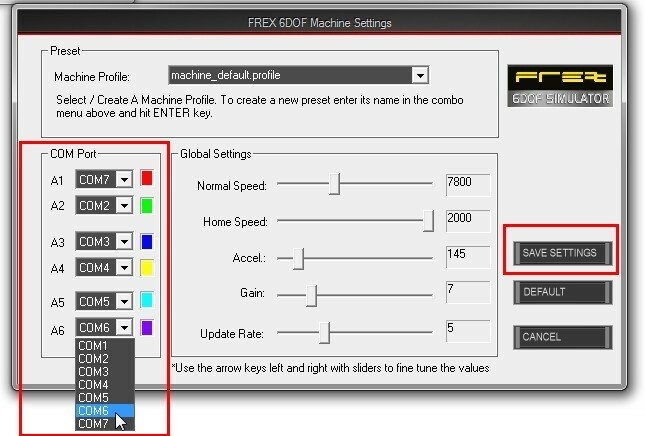 IMPORTANT: we do not do the hardware support of your simulator, if you need assistance contact FREX Japan. 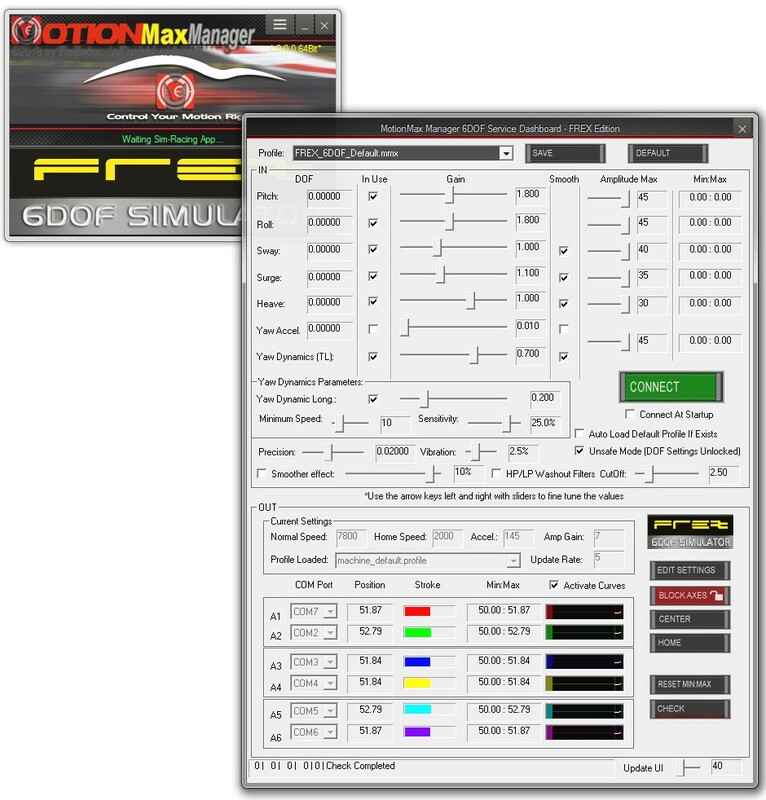 The 6DOF Simulator and MotionMax Manager use a colors code to identify easily each actuator. 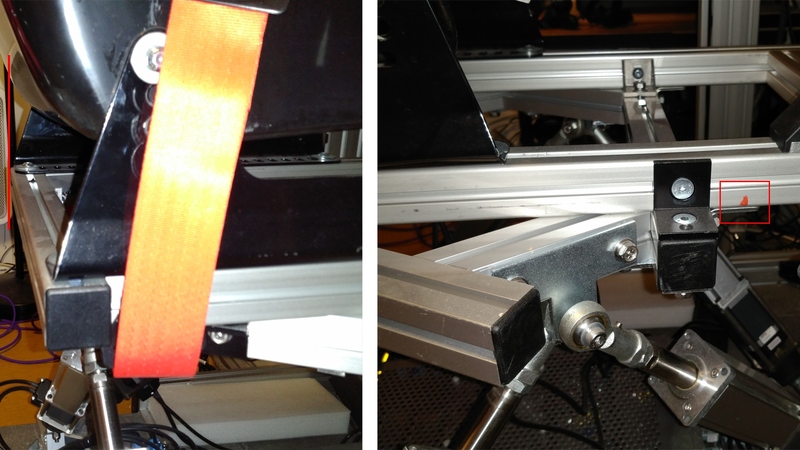 By scrupulously respecting the colors code you will be able to install the actuators in the correct order very easily. 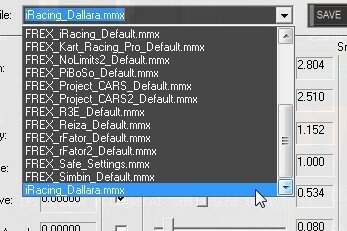 (some time we use MMX, the acronym of MotionMax Manager in the documentation). Download and run the MotionMax Manager Setup Installer as Administrator to avoid any read/write permission issue with Windows. IMPORTANT: Watch the video above(https://www.youtube.com/embed/cOL_F6QSIms?rel=0) before reading the getting started instructions below. DO NOT CHANGE any other parameters unless you perfectly know what you are doing. 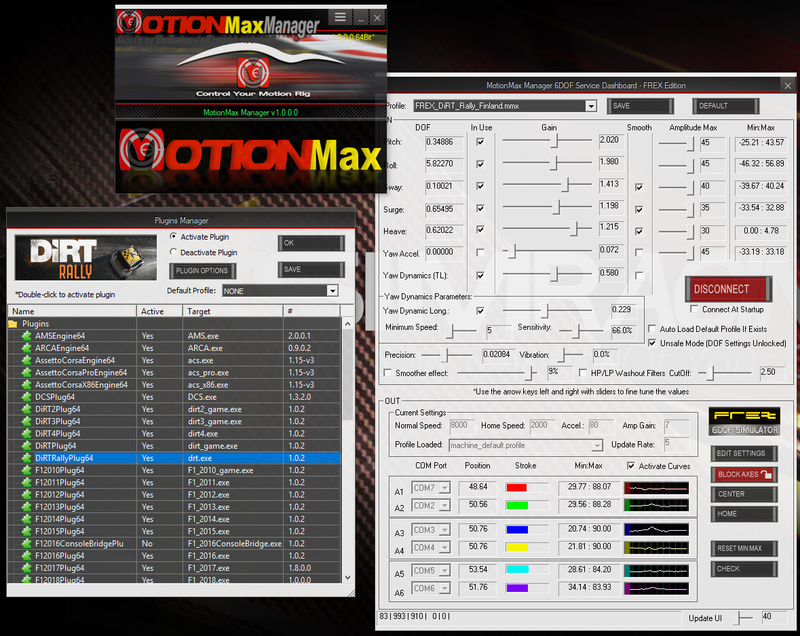 Check the MotionMax Dashboard documentation for more info on machine settings for beginner, intermediate and PRO. NOTES: We suggest to use the COM7 for the first actuator ID 1 even if the COM1 is free, the COM1 is often used by the system itself and prevents a correct initialization of the com port. Solution: you need to initialize correctly your FREX 6COM Ports Serial interface, Quit MotionMax Mgr, disconnect the 2 USB cables from the PC or from the USB HUB and reconnect them on the same USB ports. Restart MotionMax Manager, all your COM Ports should be there. 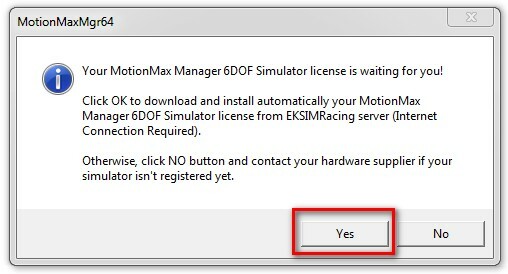 on second launch after the restart of MotionMax Manager, click YES to the dialog asking you for the license to download and install it automatically, All FREX 6DOF Simulator come with a MMX software license, so you don’t have to worry about.. Solution: Restart MotionMax Manager and everything will be OK. Solution: quit and check your hardware installation and fix the order and position of each actuator, follow the colors code to find the corresponding ID and connect each actuator to the corresponding COM Ports then restart MotionMax Manager. The Machine is now in center position and MotionMax Manager ask you to Check For Update. Click Cancel to continue checking your machine. 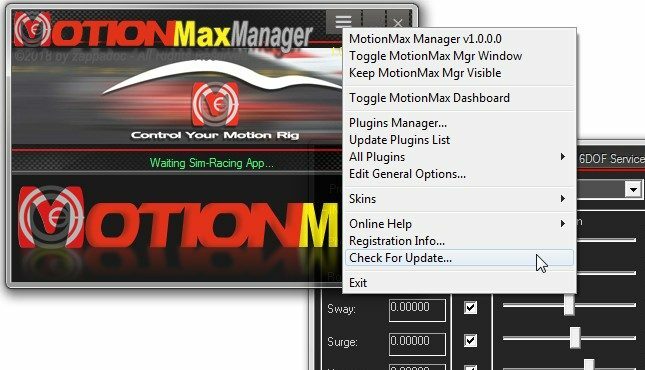 You will be able to Check For Update using the main menu of MotionMax Mgr later to keep your installation up to date. It’s recommended to Check For Update regularly to get latest plugins and updates. 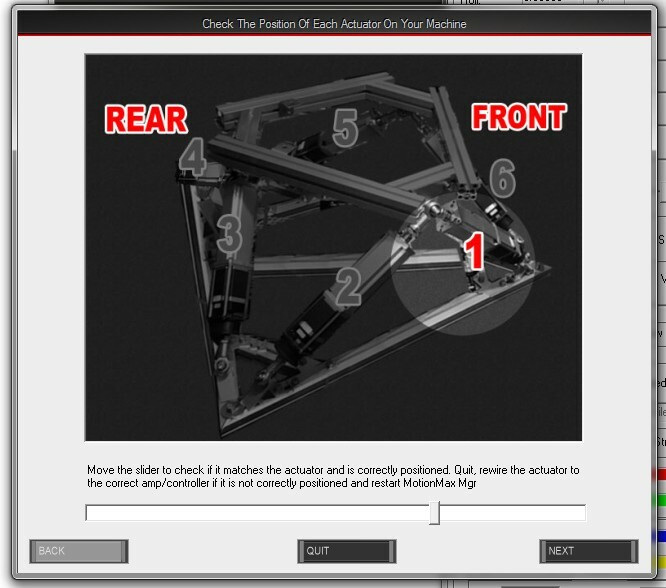 When the simulator is centered, a special wizard dialog to check your simulator will popup and helps you to verify if each actuator. 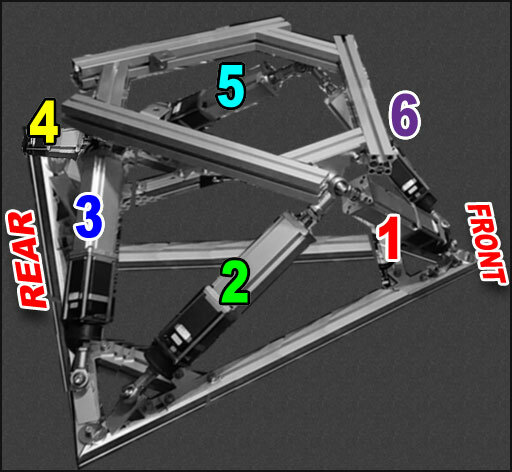 On a 6DOF platform the order and position of each actuator is very important. A complete check must be performed at least once but If you want to skip the checking process for this session, click the QUIT button and go to STEP 4, see below. With this wizard you can move actuator from ID 1 to 6 and check if they are working correctly accordingly to the instructions included with your 6DOF machine. 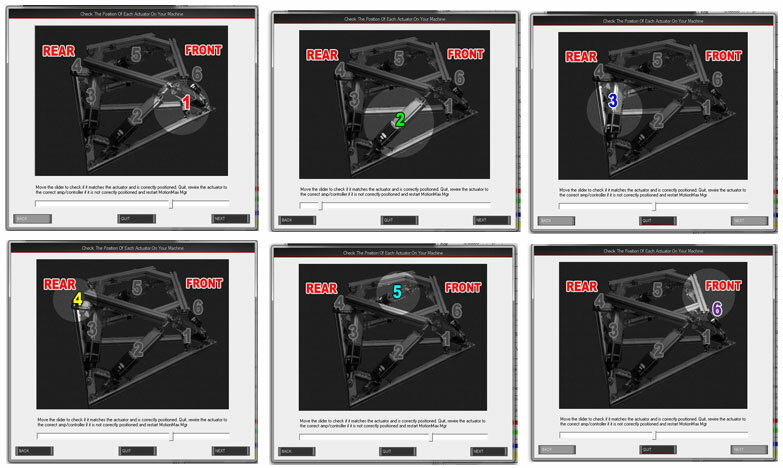 if they are not moving or not in the correct order, simply click the central button “QUIT” and quit MotionMax Manager to fix your 6DOF machine installation. when all actuators are fully checked, the process will continue by moving the machine in ever directions until DOF limits are reached. All buttons are disabled which is normal the platform is not centered. 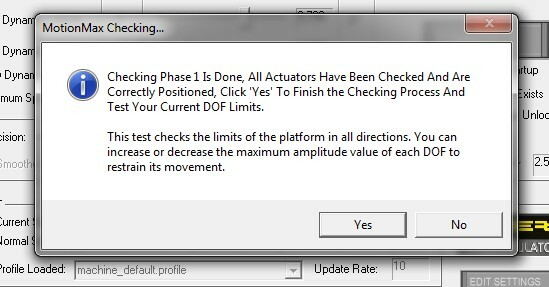 To finalize the checking process and move the 6DOF Simulator to its center, click the CHECK button. Congrats! 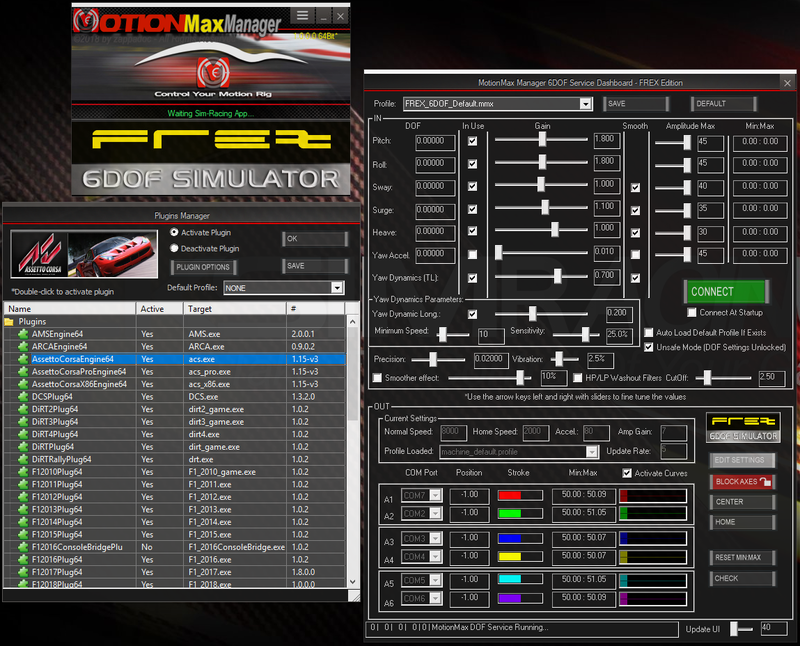 The 6DOF Machine is fully tested and MotionMax Manager is ready! We included for your convenience a bunch of profiles ready to use and to be customized. 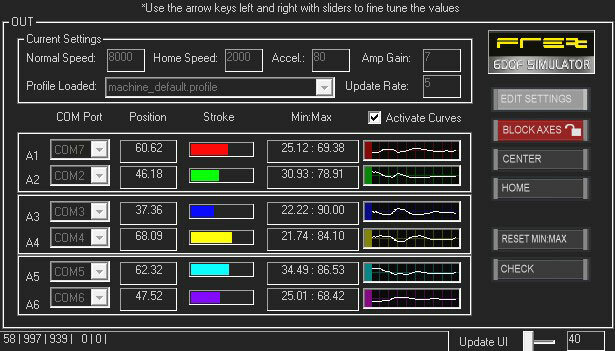 Like a real race car, a good configuration makes the difference and in a few hours you will be able to create your own profile corresponding to the car you drive and the simulation you use that suits your needs but for your first run keep the FREX 6DOF Default profile, it’s not perfect for all car categories but still a good base. Show the Plugins Manager window, Use the plugins manager to activate/deactivate plugins and configure the plugin’s options. The plugins Manager helps you to activate your game plugins and set the options very easily. It is also a way to assign a default DOF Profile to the game which will be automatically loaded at startup. Each time you install a new plugins, check if it is activated with the Plugins Manager. 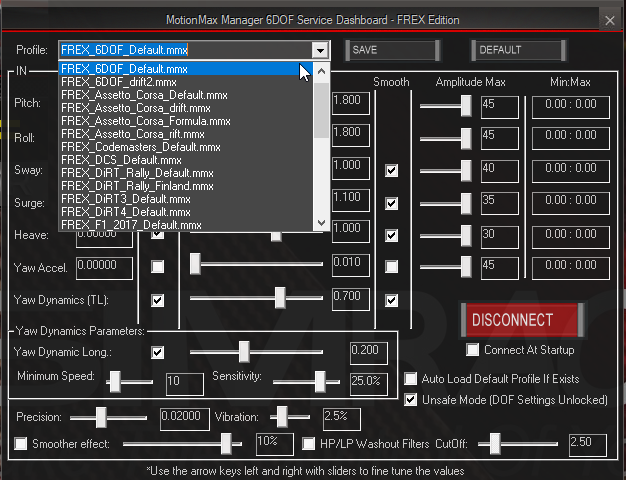 Your 6DOF Service or MotionMax Dashboard where every aspect of your machine are controlled. 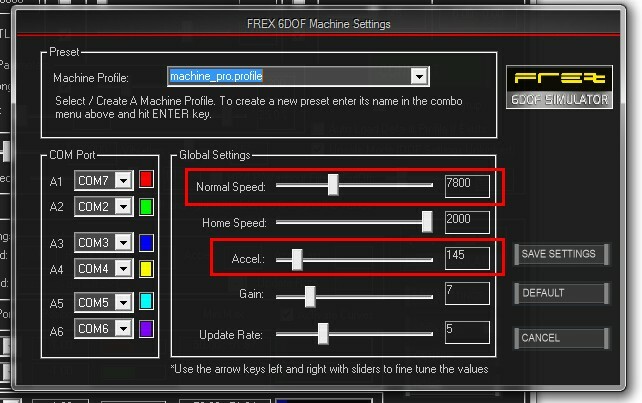 This one page settings is intentional to quickly find out what’s happening on your machine, what are the DOF settings currently loaded, the effects, the machine settings, etc. These include DOF Pitch, Roll, Sway, Surge, Heave, Yaw Acceleration, Yaw Dynamics or TL (Yaw Dynamics Parameters control efficiently and accurately the traction loss). 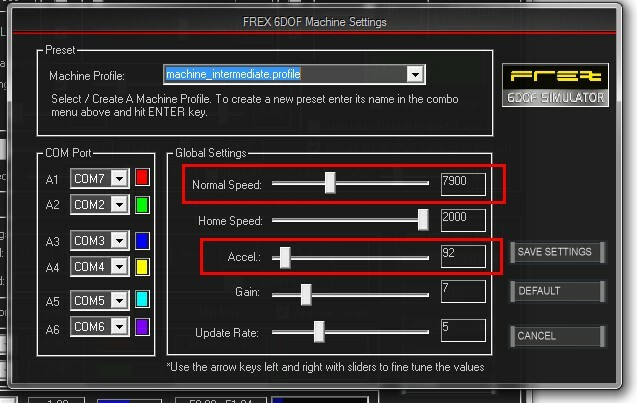 By default the IN group settings cannot be edited during a session unless you tick the “Unsafe Mode” checkbox which unlock the DOF Settings and lets you change settings on the fly like the DOF Gain, Amplitude and all other parameters. Some dashboard functions are disabled until the incoming telemetry is disconnected. It’s better to create a new DOF profile based on default rather than modify the default profile itself, this way your custom profiles will never be deleted by a re-installation. Place the cursor into the Profile combo field, type the file name of your profile and hit ENTER key or the SAVE button, The profile is saved in config directory of MotionMax Manager (in your ../Documents/…/MotionMax Manager/cfg/ directory). A notification is written in the status bar at the bottom when saved. Use these Block/Unblock button to interrupt or allow the data stream to go to the machine and stop the motion. 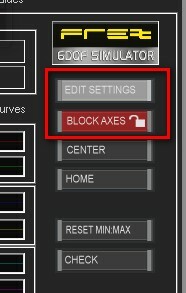 You need to block the simulator to get access to the machine settings (EDIT SETTINGS button). Change only the COM Ports assignment of each actuator in the machine settings unless you know what you are doing with other parameters. 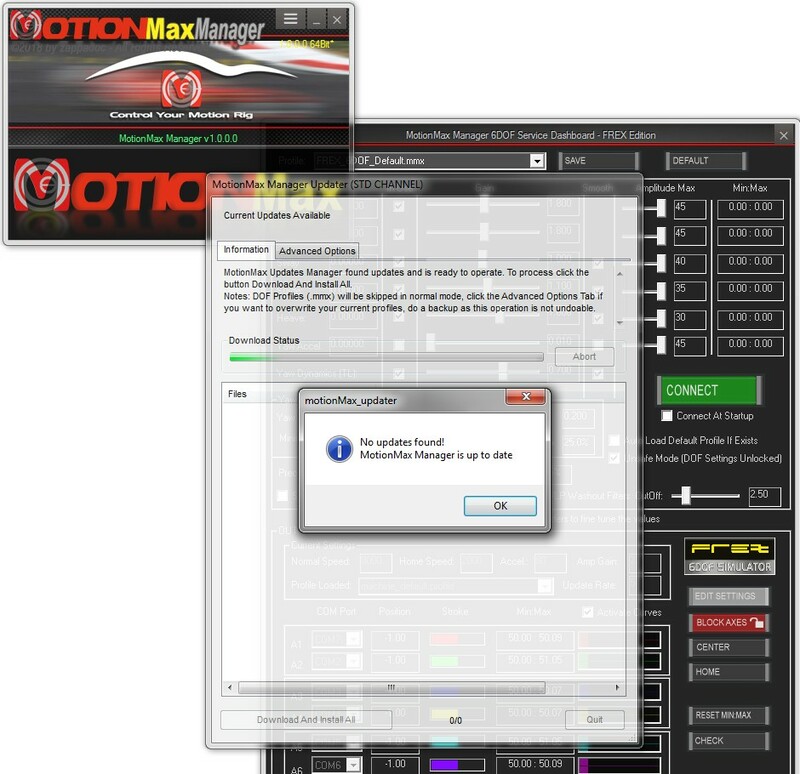 You need to restart MotionMax Manager for the change.to take effect. The status bar give you information and warning about your DOF settings and let you define the UI (user interface) update rate. The position of cockpit is very important and must be correct. – you need first to find the barycenter (center of gravity) of your entire cockpit and places it on-top of your 6DOF platform off-centered (see the image below). The simple way to find the barycenter (center of gravity) of your cockpit is to put a metal bar on floor (i.e. symbolized by the red bar in the image below. ), then put the entire cockpit with all equipment onto it and slide forward / backward gently the cockpit until you find the balance point. Thank you for your interest in becoming a MotionMax Manager Partner! (You need to be fully registered to get the MotionMax SDK and create your own game plugin. Click here to register and complete the necessary agreements)..
More videos are available in our media page, here.